This creative piece of decoration is cheap and frugal. It's a great kids craft and teaches others the value of re-purposing. It's customizable and fun to create. So Enjoy! P.S. If you don't understand what I wrote in any of the steps, the pictures should guide you. Toilet paper rolls (or paper towel rolls). I used 20 toilet paper rolls. Measure one inch strips on the toilet paper rolls and make tick marks. Cut across where the tick marks are. You will end up with circular tubes. Arrange the Christmas tree using the toilet paper tubes. I placed 5 tubes on the bottom, 4 in the next row, 3, 2, and 1 on top. That is my Christmas tree. Then, I formed a star on top of the tree using 5 tubes. I pinched two sides of the tube to make it more oval-ish. If you want, you could shape the tubes on the trees to make it more circular. I did not because every leaf/ornament on a tree is different. After arranging the toilet paper roll tubes, you are ready to glue! Glue each piece together carefully. I used hot glue, but I'm sure liquid glue would work too. I put together the tree and star together first, then the outer heart. Form the letter H by flattening three tubes and gluing them together. Attach one tube to the right side of the H, so therefore, it reads "Ho" Make three Hos. Attatch one on the left side of the tree, one on the right side, and one under the tree using the glue. Trace and cut 6 circles of one shade of green and trace and cut 3 circles of another shade of green. Also trace and cut three circles of one color besides green and three circles of another color besides green. I applied a thin layer of glue to my circles and added a thin layer of glitter, but it's entirely optional. These are the ornaments of the tree. Put a layer of glue around the whole circle. Do it for the green circles. Stick the circles to the reverse side of the tubes, alternating rows of color. I put one dark green circle every other tube/spot in the first, third, and fifth row of the tree. I put the light green circle under every other tube of the second and fourth row. Do the same for the colored circles, placing a layer of glue on the outer edge of the cir and sticking on the opposite side of the tube. Alternate the two colors. If you want, if the circles stick out outside the tube, you could trim it. I did not because I believe every leaf looks better if it's unique/uneven. Using markers, decorate the three Ho(s). I used my red marker to make candy stripes on the first "Ho" , polka dots on the second, and a plaid dot on the third. So now, the words "Ho Ho Ho" seems more cheery and bright. 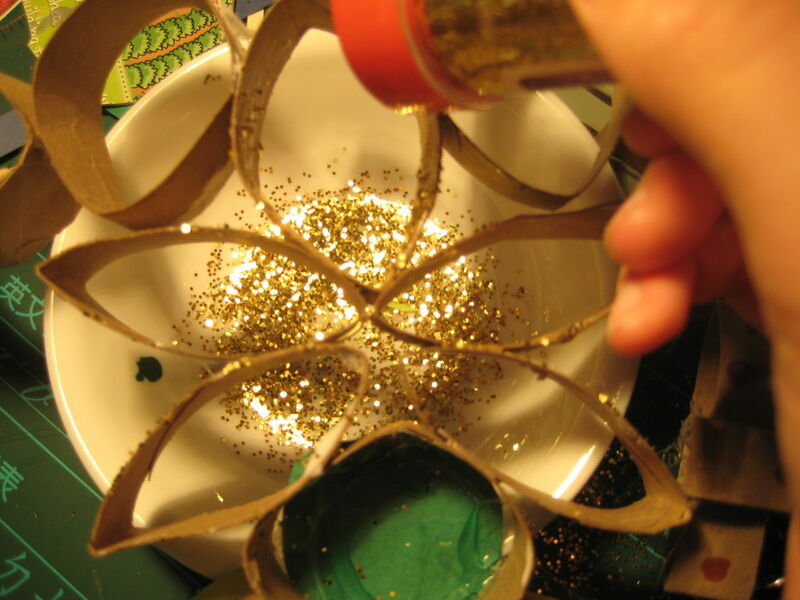 Add a thin layer of glue on the tubes that form the star, both inside, outdside, and on top. Place a bowl underneath it to collect the fallen glitter( trust me, there's going to be a lot). Shake the glitter on the star until you are satisfied with the amount of glitter on top. Another option is to simply color the star yellow using markers. Using a brush, paint the inside/outside of the tubes that form the tube. I used white acrylic paint. Once ou're done, hang it up for others to admire. Of course, this is just the way how I made it. You could use the tubes to create many more patterns. For example, instead of a heart around the Christmas tree, you could form a star. if you celebrate Hanukkah, form a Hannakuh star or candle. There are many variations to this, so feel free to mix/match to form another wreath. The best part is that it's cheap to make while creating a professional look! Have a craftastic holiday! if you like this, please vote for it for the holiday contest. Thanks a lot!